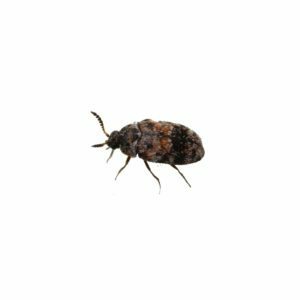 Unlike many pest infestations, an infestation of warehouse beetles is indicative of a sanitation issue. Adult warehouse beetles are good fliers. Larvae prefer dark, undisturbed places. Larvae cause most of the damage by their feeding; however, the larvae also are a health concern because of the brittle hastisetae (barbed hairs) they shed. Ingestion of the larvae or larval molt of warehouse beetles can cause enteric or intestinal irritation, especially in infants. Brownish black with variable yellowish to yellowish brown markings. 1/8 inch (3.2 millimeters) long. Adults measure 1/8 inch (3.2 millimeters) long and oblong in shape; brownish black with variable yellowish to yellowish brown markings. Dead insects and other animal remains, pet food, dried dairy products, grain products, confectionary products, nuts, seeds, and almost anything – hence the name. Females can lay nearly 100 eggs over several days. In ideal conditions, eggs hatch in six days. Developmental time (egg to adult) is 32-43 days depending on temperature, relative humidity and access to food. Warehouse beetles survive in undisturbed, out-of-the-way places in every building. An abundance of warehouse beetles is symptomatic of sanitation issues, which is the actual challenge in controlling this common pest.